I am not typically a fan of our local utility as they continuously escalate prices in an era when their cost of electric production should be plummeting, but I've seen them locally taking a proactive step and I wish more companies would follow their lead. As part of their work to manage the growth of trees around overhead power lines the National Grid does routine tree trimming to take away limbs that could impact the power lines in the event of a wind or ice storm. In the past week they have been concentrating their efforts around our community and the evidence is everywhere. I think if you looked around you'd be hard pressed to find a single tree that is threatening our overhead power lines right now. Given the warm, El Nino influenced winter we're having and the similarities to 1998 when our region was hit by a paralyzing ice storm this is both proactive and surprisingly visionary. I hope that this isn't just some government grant to keep stabilize National Grid payrolls, I'm hopeful that this is an example of a large corporation realizing that a small investment today can pay great dividends in the future through reduced exposures. More companies should take up the "Invest for Today, Win Tomorrow" mantra over the "Cut Costs Now, Cut Costs More Tomorrow" policy that is so prevalent in corporate America today. Overnight the Bank of Japan announced a fairly shocking move to Negative Interest Rates (you'll hear this referred to as NIRP - negative interest rate policy). This really caught investors flatfooted because just a week ago the Bank of Japan said they had no plans to adopt such a policy. In a nutshell, here's what this means - If you buy a government bond in Japan (ie, lend them money) you get to pay the government for the pleasure of lending them your money. Yes, this is crazy, but this the world we live in now. Japan has now joined a number of European countries in trying to reflate their economies using old world techniques. This is akin to a cable TV company hearing that subscribers are leaving them for Amazon Prime & Netflix so they decide to give you a free typewriter with every upgrade. The central banks around the world are fighting a losing battle to increase inflation (and wages, etc) with tools from the 20th century. However, we're in the 21st Century and the globalization of our economies means that these tools will no longer work. Deflation is a beast that can't be contained within borders. If prices rise in country X, you move your operations to country Y to lower costs. This is why we are seeing so many of our global economies struggle. In the long run, this is a very bad sign for the world's 3rd largest economy and it furthers my argument that Japan is a larger version of Greece with a worse demographic outlook. The global stock market reaction has been very weird. Initially stocks soared 2% globally only to fall back into negative territory within the hour and then soar again in a very organized trade overnight. While I think you could argue that this is a mild positive for the Japanese stock market (their plan is to weaken the value of the Yen which will increase stock prices, however since your Yen will buy less the average citizen would not be impacted) but the argument that ALL stock prices should rise is really flawed. The 2nd and 3rd largest economies in the world are beginning to engage in a global currency war (China might pull their own black swan and really devalue the Yuan in response). This will make our products much more expensive globally and damage the US economy in the long-run. Currency wars are a zero sum game, if Country A wins, Country B loses. However, markets are no longer based on rational thoughts like these. Today, the mantra will be - BUY EVERYTHING BECAUSE THE CENTRAL BANKS WILL SAVE US AGAIN! Good luck and remember that Selling the Rips has been the only winning strategy in 2016. Any chance to use one of my favorite song lyrics in a blog post is always a plus. This is a very long article from Atlantic magazine (does the Atlantic even bother to write short articles?) but I'd suggest you take 10 minutes and give it a read this weekend if you value your privacy. "The company has taken roughly 2.2 billion license-plate photos to date. Each month, it captures and permanently stores about 80 million additional geotagged images. They may well have photographed your license plate. As a result, your whereabouts at given moments in the past are permanently stored. Vigilant Solutions profits by selling access to this data". As my increasingly wary teen daughter said tonight "We might have to resort to riding our bikes to the store so Amazon won't know when we're out of milk". Since I'm in a link sharing mood: This interactive chart from McKinsey should be on the home screen of every parent with a child looking at colleges. While at first it appears very cluttered, I'd suggest you breakdown the data by selecting specific industries (uncheck the "ALL" box on the right hand side of the chart). In essence, the chart is designed to show you the percentage of a job that can be automated (ie, replaced by a robot or software) versus the pay of that job. Ideally you want to be in the lower right hand of the chart --- low % of automation & high salary. However, more interesting are the jobs in the middle and toward the top. These jobs are high paying but are subject to a high degree of automation. Network administrators, nuclear power plant techs, etc., these jobs might be in real trouble when companies look to cut costs through automation. I'd say however, that much of this chart is based on standard industry inputs. They show very high demand for financial planners, etc., however, I actually think that industry will be completely dead in 20 years so take it all with a grain of salt. Either way it should prompt some interesting conversations. Today's little temper tantrum in the market caught most of us by surprise. The consensus expectation for what the Fed would say was actually pretty accurate and yet, the market acted as if it was surprised that most Fed forecasters were actually right. After 7 years of extraordinary measures to attempt to rescue the US economy the Fed decided in December it was time to see if the economy could ride down the driveway without its training wheels. The market has responded as it has at each previous point in the Great Recovery - selling off hard and demanding more Fed measures to prop up equities at any and all cost. Well, now that the Fed seems to be working with either bad data, old data or is just clueless, the markets have become rattled and the question bouncing around Wall Street is should we Sell The Flipping Rip - #STFR (ie, sell every bounce). So far in 2016, #STFR is winning this battle of wills, but there will be plenty of opportunities for the dip buyers to have their day. Facebook will be the talk of the town tomorrow after delivering good results (though average daily users seems to have plateaued thankfully). I'd expect plenty of Fed chatter as they try to confuse the market with what their message REALLY is. If you've been on the right side of the trading in 2016, this has been an incredibly lucrative year in the first month. However, I suspect many active traders are getting burned by chasing ideas and that means there may be fewer natural buyers if we get close to those dangerous levels on the S&P 500 again - 1820 is a number to have on a post-it note in your office. If we break that number the implications for everything from state budgets to the 2016 elections will be huge. Based on the popularity of yesterday's cable modem post I thought I'd follow-up with another Time Warner/Charter news story that emerged from Albany yesterday. Time Warner and Charter Communications finally completed their merger just 10 days ago. As a reminder regulators had previously scrapped a proposed Time Warner/Comcast merger because it would harm consumers and limit competition. However, according to this story from the Albany Times Union Time Warner appears to have decided 10 days is long enough to wait before putting a world of hurt on consumers. "Time Warner’s standard TV package will increase from $76.99 a month to $78.99 a month. The TWC Sports Pass, a premium sports tier that is added on, is rising from $8.99 a month to $10 a month. There are also new prices for the company’s basic and standard Internet services, which will now be $49.99 a month and $59.99 a month, although it is unclear what the current prices are for those offerings." reduces revenue, so they raise prices which chases away more customers which...etc, etc. It came to my attention over the holidays that many, if not all, of my family members were still "renting" their 5-8 year old modems from Time Warner Cable for $6-$8 month despite my previous post on why you should buy your own modem (see my post here from 2012). However, with news coming out over the holidays that Time Warner was going to hike the rental rates again for these modems to $8 to $10/month everyone seemed to take a renewed interest in buying their own modem. Imagine if a garbage collection company like Waste Management said we'll charge you $45/month for collection and they gave you a six year old green Waste Management garbage can to use as part of the service. However, imagine if after three years of service they decided that they needed to charge you a "rental fee" of $6/month for the garbage can. Well, you'd probably tell them to keep their garbage can and you'd go to Home Depot and buy your own for $40. Well, this is basically what Time Warner is doing. Most people have old, antiquated modems in their homes which would probably be tossed in the recycling bin if returned to Time Warner, but because a modem is more intimidating than a garbage can people won't swap out their modem and they continue to keep giving Time Warner an extra $8 per month. 1) Visit the Time Warner Cable page and look up your plan & modems that they suggest for your plan. Unless you live in NYC and have access to 300mbps downloads, most of the widely available units will work. 2) Buy the best router you can afford. The incredibly well rated Arris Surfboard SB6141 can be had as a refurb for $55 on Ebay. 3) Follow the easy instructions here to activate your new router. *** One caveat - Charter Communications, which recently merged with Time Warner, doesn't break out their rental fees for modems. If Time Warner were to implement this policy (ie, instead of charging $49.99 + $10 for modem rental, if they just charged $59.99) it would throw a wrench in this plan. One more Time Warner rant - I know most people know to visit www.speedtest.net to ensure they are getting what they are paying for with Time Warner. Two weeks ago we noticed a deterioration of our internet quality. We have the Turbo plan (20mbps down/1mbps up) but when I ran the speedtest I was getting 1.5mbps down & 1.1mbps up. I contacted Time Warner Cable online & within 15 seconds I was restored to 20+mbps down. There was no explanation of why we had been throttled but it was clear that we weren't getting what we were paying for. So after another nail biting week in the markets it appears as though the global bounce is in full force this am as most markets around the world are up 2% or so. * We're due for a technical bounce. I won't go into the details here but the markets are believed to operate like a falling ball. If they fall hard and fast enough they will eventually bounce a little, much like a rubber ball falling off a table. Doesn't that make you feel better about the safety of your 401k? * The data out of China appears to be so bad that there is a growing consensus that they will have to artificially reflate their markets. Again, this is nothing sustainable just further hopes and dreams for more monetary stimulus. * The pending bankruptcies across the energy and commodity sectors. * The impact these bankruptcies have on the global financial institutions (many of our largest banks are reporting $20+ Billion in exposure). * Have we entered a new paradigm where "Sell every rip" replaces "Buy every dip"? * The global debt feast may be ending - total global debt is up from $77 trillion at the peak of the '08 financial crisis to over $102 trillion today. * The way the world and markets have changed in the past 15 years. 85% of Wall Street traders were not in the business during the dotcom crisis. Almost half weren't around for the 2008 crisis. The speed of swings in today's market is unlike anything that existed 10 or even 5 years ago and the ramification of these changes is not widely understood. I hope to take some time in the coming weeks to dig a little deeper into many of these topics. Build a quick and easy camera cover for iPhones. Why would this be in demand? are they showing a positive or negative emotion? The faces are pixelated to provide user anonymity without sacrificing the expression. Apple using my camera to judge my reaction to everything I see, hear or read on my computer (assume it will be phone as well). Thanks - I'll pass. Markets are swinging wildly again as there appears to be a significant problem in the global currency markets. The Chinese will aggressively seek to stem the rapid Yuan devaluation but this freight train might be reaching terminal velocity and they brakes are failing. In a rather sad turn of events today a mid-sized hedge fund based in London has decided to close their doors and return money to investors. Below are some comments from their letter to investors with summarizes brilliantly the changes that have occurred in the markets in the past 10 years. When people ask me for my opinions on the markets or the economy, I often tell them that it really doesn't matter because the markets that I grew up in, the markets that you hear about on CNBC or on the evening news, no longer really exists. The market today is a rapid fire game of computerized trading that humans need not participate in. Here are some selected snippets from their final letter to investors detailing their decision to shutdown (I've done some editing to shorten the letter and focus on the message). "Our process marries the top down forecasting of key macro-economic variables with the bottom up forecasting of company earnings. Access to transparent and truthfully compiled data. Logical decision making by policy makers. A reasonable spread of uncorrelated potential investments across time zones. Data releases have become much less transparent and truthful at both a macro and a micro level. Unfortunately, an ever growing share of the most important data China and India produce is simply not credible. Currently stated Chinese real GDP growth is 7.1% and India’s is 7.4%. Both are substantially over stated. This obfuscation and distortion of data, whether deliberate or inadvertent, makes it increasingly difficult to forecast macro and hence micro as well, for an ever growing share of our investment universe. Corporations have also responded to greater market scrutiny since 2008 by disclosing less not more, on the basis that the less they reveal the less often they can be proved wrong by regulators, investors or law courts. Assuming we can obtain trustworthy data we then apply logic to produce our forecasts. The validity of this process becomes questionable if economic policy makers do not themselves apply economic logic and in a transparent manner. The recent massive increase in market share of both ‘dumb’ index funds and ‘black box’ algorithmic funds creates a situation where equity market volumes have fallen sharply and individual stock volatility has risen dramatically. In such a world dominated by index and algorithmic funds historically logical correlations between different asset classes can remain in place long after they have ceased to be logical. Index and algorithmic fund moves also make it very hard to ascertain what the markets ‘clean’ positioning is at any given time. In summary, all of the above factors now mean that it is more difficult than ever before for us to accurately forecast macroeconomic and corporate variables. This has made what we enjoy most – the thrill of analysing economic data releases and company accounts – no longer enjoyable. It is therefore time to accept that what we have done has worked brilliantly for twenty years but does not work anymore and move on. We are confident our process will eventually work again – for the laws of economics will never be repealed – but for now they are suspended and may be for some time; an indefinite period involving indeterminate levels of risk during which we think it would be wrong for us to be the stewards of your money. I could not agree more with these points. So, when I wrote on Tuesday that China faced a potential currency crisis I didn't think that it might unfold THIS WEEK. While things have settled down a bit overnight here is a quick summary of what is happening and why you should care. 1) China's economy is faltering. 2) Their currency does float vs. other currencies but only based on a once daily exchange rate. 4) Say you had 100 yuan (Chinese currency) worth of stock in company XYZ. The devaluation means that instantly it is worth 99.5 in yesterday's yuan. In normal markets sophisticated investors just hedge away this kind of currency risk. However, the Chinese stock market is not normal and it has been overrun by small, first time investors. The declines this week have caused the herds to race for the exits which are increasingly narrow. For example, today their market opened, immediately fell 5% and was paused for a 15 minute break. When they reopened the markets fell to -7% for the day and that triggered a full day closure after just 14 minutes of real trading. This is the second FULL DAY suspension of trading in the first 4 days of 2016. The Chinese central bank has since intervened again to calm investors but I think their ability to control this market is limited. Lately, the major activity in the markets has been occurring between 12am and 4am EST (humans need not apply) and the actual trading during the day has been less eventful. It's feeling very much like 2008 all over again. North Country Public Radio did a piece today covering the dissenting view on NY State's latest efforts to help Alcoa and by default, save the associated jobs in Massena. 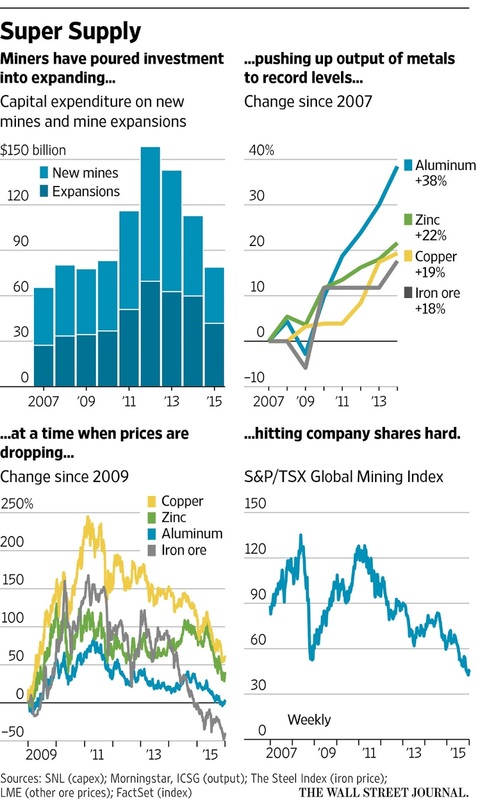 1) Alcoa plays in a very large global commodity complex. 2) 6 years with interest rates at or near 0% has led companies to chase yields which often results in industry-wide over expansion. To that end, note this article from the WSJ on the expansion of supermines and what it means for global commodity prices. In particular, note this chart via the WSJ. Look at the explosion of supply in Aluminum (up 38%), the decline in price and then factor in that we may be entering a global economic slowdown. Then ask yourself - hmm, should NYS really be trying to invest more money in this industry? After limping into the finish line at the end of the year, stocks opened yesterday in full panic mode. While there were vague attempts to blame the same old suspects - a China slowdown, oil, conflicts in the Middle East - the reality is this was just more sellers than buyers. Countless strategists have flooded the airways over the past week telling us all how the US stock market will end 2016 up about 8% but none of them could see what might happen on the first trading day of the year? This should give all of us pause when considering the validity of their "forecasts". There were two large mysterious buyers in the market yesterday that really turned the tide and a late day program trade saved the markets from being off even more. China intervened substantially in their markets overnight to little effect but I believe this will be a major theme in 2016. * China - Their economy is in trouble. I'd call it a growth recession coupled with a pending financial crisis and I don't think they have the policy tools to manage the problem. There is a 50% chance of a currency crisis/credit crunch/banking collapse (ala 2008 in the US) in China which could severely damage the world's 2nd largest economy. There are geopolitical impacts from this forecast as China may be tempted to do something rash (just google "senkaku islands" for an idea). * Oil - This is one of those issues that is too complex to summarize in just one paragraph but I'll try. The global effort to spur investment at any cost (unusually low interest rates in the US and around the world for 6 years) did just that - it caused a massive over investment in every part of the commodity complex including oil. When one company over invests, this it isn't a problem, but when every part of the oil chain over invests you create the glut that we have today. On the demand side, I think we will see further weakness in 2016 while production remains high. The impact on the US is probably a small negative because many US producers may go bankrupt if the market continues like this in 2016. Globally, low oil prices might spur some wild actions (see the latest Iran v. Saudi Arabia dust up) and that remains a wild card. * The Fed - the Fed has painted itself into a corner. The Fed is still operating like it is 1950 and they can control the US economy with a single interest rate. The reality is that in today's global economy the Fed can no longer spur investment and job creation with a simple policy. We are world awash in excess supply and countless Janet Yellen speeches will not change this. I believe there is a 50-60% chance that the US economy to hit a stall speed or even dip into recession in 2016 and the Fed will have no ability to respond to this move. Once the global markets discover this fact it will be very interesting to watch. I'll add some more observations and thoughts in the coming weeks, but in general I believe 2016 is shaping up to be very similar to 2000 or 2008.